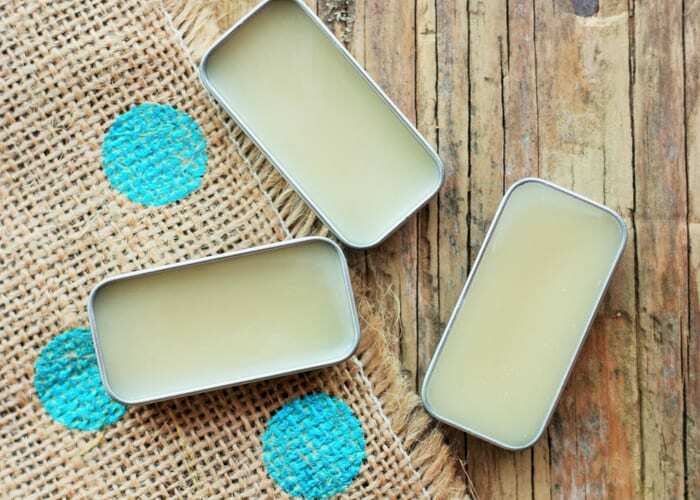 This DIY project with step by step photos will show you how to make homemade chapstick. This natural recipe uses only five organic ingredients like coconut oil. Homemade chapstick owns my heart. I can’t emphasize enough how much I need chapstick around me. Constantly. I have them stashed all around the house to make sure I’m not away from the precious stuff. My purse has a chapstick and a backup chapstick. And you know what else? 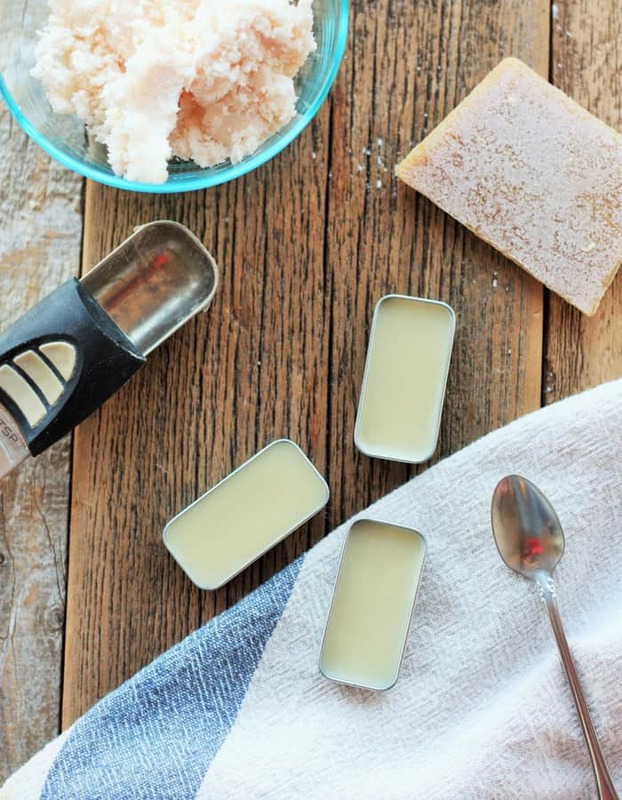 This homemade chapstick makes an easy holiday gift. We’re talking 15 minutes from start to clean-up. You can do this. 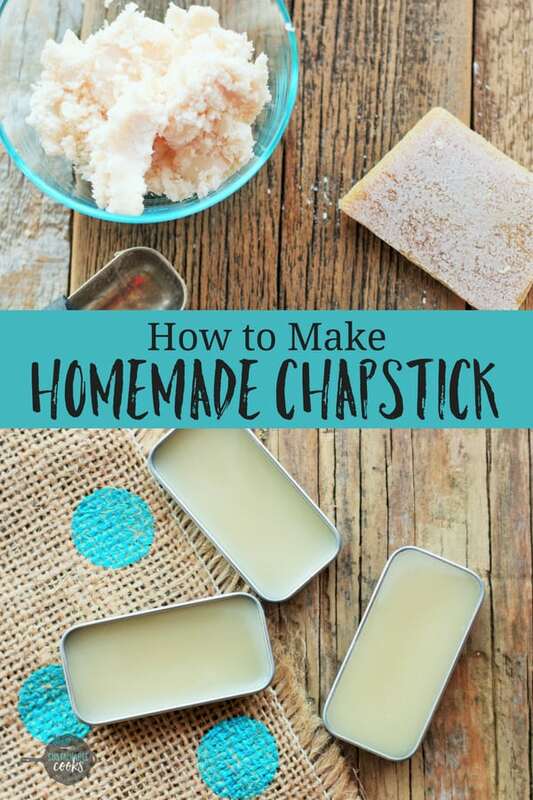 Homemade chapstick has been a game changer for me, and I hope you love it as much as I do! Pour 2 cups of water in a medium pot, and fit with a double boiler. Place over medium heat on the stove. Add the beeswax and shea butter, and heat until melted. Add the coconut oil, sweet almond oil, and honey and stir with a spoon you plan to only use for working with beeswax. Heat until the coconut oil has melted. Pour into your containers of choice, and allow at least 15 minutes to cool. If you want to “flavor” this, you have two options. You can add essential oils to the double boiler when everything is melted, or you can add a few drops of essential oil into your container. If adding them in the containers, you’ll want to stir with a toothpick right after you’ve incorporated the melted mixture. For a harder chapstick, you’ll want to go a bit heavy on the beeswax. For a softer chapstick, add a bit more sweet almond oil. If you have a coconut allergy or don’t enjoy coconut smell, try subbing in all shea butter. 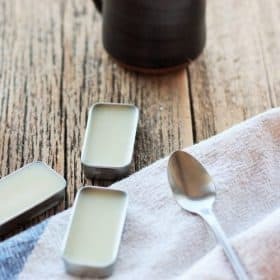 Easy Homemade Chapstick that takes a whopping 15 minutes to make. Great for every day and amazing for holiday gifts! If you want to "flavor" this, you have two options. You can add essential oils to the double boiler when everything is melted, or you can add a few drops of essential oil into your container. If adding them in the containers, you'll want to stir with a toothpick right after you've incorporated the melted mixture. For a harder chapstick, you'll want to go a bit heavy on the beeswax. For a softer chapstick, add a bit more sweet almond oil. From my understanding, honey is the only food that never goes bad. So considering this recipe has honey, and beeswax, I can’t see this chapstick going rancid any time soon. I have some containers that have been around for at least 2 years and are fine. What can you put in it to get that Carmen “warming” feeling? I like it’s “healing” feeling and would like to incorporate that. This may be a dumb question but is there a substitute for the beeswax? I’m very allergic but would still like to make my own chapstick. Thanks so much! Learned a lot with this simple lip balm. 1). Make sure you read the directions properly. 2) Nothing is as simple as it seems. 3) Love my hand mixer. After making the proper adjustments, I ended up whipping the mixture with my handy, dandy electric hand mixer. Then used a spatula to fill my containers. The wax kept solidifying in the bottom. Whipping fixed that problem. However I don’t know why that happened. Any suggestions?? Also how do I get wax off my implements? Hi! this is great, but I am super allergic to coconut and almost all recipes I find like this involve coconut oil… is there anything that can be used instead? You’d want a solid oil to replace the coconut…like shea butter. You can use almond oil. I love this, I used the little Altoids tins for mine. I also added some vicks vapor rub to the mix for camping (2 spoon full). It makes the best rub for hands and feet. I to had a mess with wax on my beaters so I put them in the oven on a cookie sheet at 350 degrees for about 5 to 10 minutes to melt off the wax then wash in very hot water. My dish washer is great for this. Hope this helps! I’m sure it could be! No idea of the ingredients, but snag a medicated chapstick at the grocery store and check the ingredients. I’m sure there is a mixture of a few essential oils. Would love to make this! I want to add vanilla to it. Would pure vanilla extract work or should I use vanilla essential oil? Thanks for your thoughts! Probably essential oil if you want a strong scent! Hi Lisa, the containers were from Sunburst Bottle company, and Amazon. The amount it makes depends on the actual size of your containers. One batch makes enough for all my Christmas gifts for the year. I just made these and they are awesome. However, I had an issue with the honey dissolving. I was wondering if I was able to use the beeswax pellets? Would it be the same as using the block?? I’m sure it would be fine! beeswax is REALLY hard to grate if you get a large block of it. I suggest melting the whole block and dribbling it into a large bowl of ice cold water to make your own pellets. I used organic beeswax (local farm), and organic raw honey (also local). Subbed half the beeswax with cocoa butter, added a few drops of candy flavoring. I think you can get little containers like that from the Dollar Store too. The recipe looks delicious! I’m thinking a vanilla added would be yummy. I might make the lotion bars in the future but I’d but one right now from your Etsy shop. Hint hint. you know what I love best about this? That you make it for me. I made these today to include in holiday gift baskets. I tested a tube, and it has a long-lasting smooth, moisturizing feeling that’s so much better than store-bought lip balm. If I used tubes (rather than tins) again, I think I’d get a little pipette to make them easier to fill. So excited to share these with friends and family! So glad you liked them, Katie! I have done the tubes before and yeah it is pretty messy if you’re not careful. We did our test run of your lip balm recipe in preparation for my daughter’s “unicorn lip balm party” and SUCCESS! Thank you for your incredibly easy instructions and list of ingredients-I found them all at my local natural store except the tins which I got online and the stickers which I made (I even used the muffin scoops you had recommended to scoop out the coconut oil with less of an issue). The party isn’t until March, but we’re ready! I gave out a few samples at the adult birthday party I went to (side note: we threw axes, I, despite my non-athleticism, did well!) and they were happily received. A gift for adults and kids alike! Sarah, thanks again for making #adulting #momlife easier; I feel like I should pay for all your recipes/advice etc. Any way we can donate to the cause? Oh my goodness, a unicorn lip balm party sounds pretty awesome! Did you do any colors/tints or glitter to truly make it unicorn(ish)? Throwing axes is so much fun! Troy and I used to do that pre-kids and man what a good stress reliever. Haha! I think I’m going to keep glitter (“the STI of the crafting world”) far away from the party but perhaps tinting it could be fun. Otherwise, I printed Avery Label round stickers with a unicorn on them for the tins for the #easywin. Why does it not surprise me that you and Troy threw axes before it was trendy? I’m sure you could kick all our butts! I also must say that the snow day struggle is REAL! and I love your mission to consider food pantries etc for families who rely on schools for food! You are my role model! Glitter is a non-starter in this house, so I feel yah!! If you have any ideas for the snow day food pantries, I am ALL ears.